When did you start with OYT Scotland? I first started volunteering with OYT Scotland while I was at University. My dad was a volunteer first mate and he inspired me to get involved! I went on an induction voyage in 2013 and have been volunteering ever since. What’s your favourite OYT Scotland memory? It definitely has to be one of my first voyages, which was with a young carers group from Glasgow. Everyone was on deck watching a beautiful sunset as we sailed past Arran, and then the dolphins arrived! It was an amazing end to the week, and I’ll never forget the smiles on everyone’s faces. What is your job outside of OYT Scotland and what particular set of skills do you bring to the organisation? I have just started my PGDE, so hopefully by July I will be a Primary School teacher! However before I started my course I worked as a fundraiser in Glasgow. I hope that my passion for working with young people and my background with the third sector will be skills I can bring to OYT Scotland. Why do you enjoy being on the board of OYT Scotland? I am delighted to have just joined the board, and I am excited to help the organisation continue giving young people such incredible opportunities. 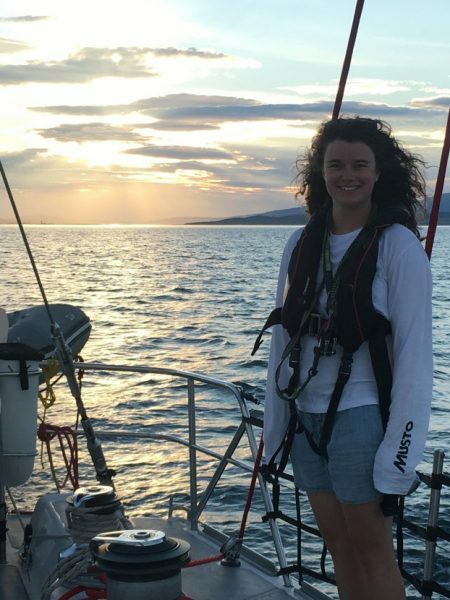 What are your hobbies apart from sailing with OYT Scotland? I’m pretty busy at the moment with my course, but when I’m not sailing or studying I try to spend as much time as possible enjoying the outdoors with my family and friends. I love getting out of the city and walking the dogs, but if I’m at home then I’m usually curled up on the sofa with a book or a movie.